Everyone who lives alone knows what a struggle cooking everyday is, you’re either tired from work or school and food preparation is the last thing on your mind. Well that’s what my blog is for! 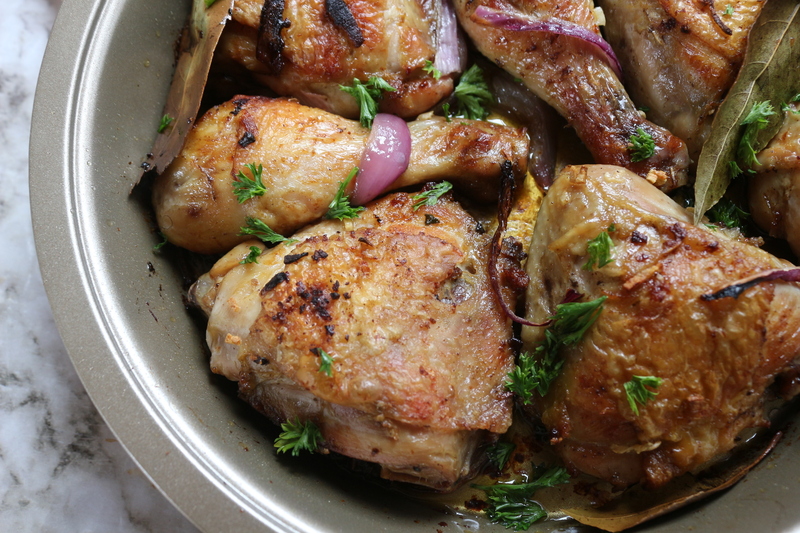 Quick minimal effort dishes like this juicy chicken that takes 30 minutes to make! Serve it with a creamy potato salad and a glass of crispy wine and you’re set! Warm a little oil. and add your chopped garlic, place your chicken and brown on each side for 4 minutes. Transfer to a baking dish and add your quartered onions and bay leaves and pop into a hot oven for 20 minutes until the skin crisps up then enjoy! Previous Post White Star Giveaway..
Next Post Spicy Livers ‘n Chourico..